This cool loking fella dont take life to serious. Smoking and smiling whilst wrenching to repair a blown rear tire. 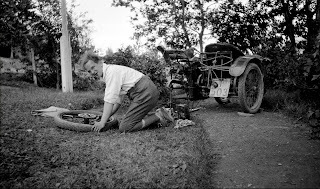 Punctures, they dont happen to often anymore when there are no horse-shoe nails in the streets. Anyone got an idea in what bike this is? Think early Indian myself.